I finished up the binding on L's baby quilt today. I'm so happy with it, and happy to finish one of my bigger projects. 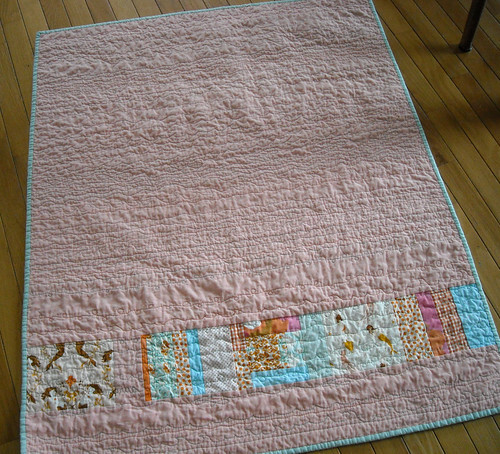 *quilted with waves and fishies and a few swirly lines, mostly in aqua thread but some orange too. Her name is quilted on there as well. happy baby--I think she likes it! 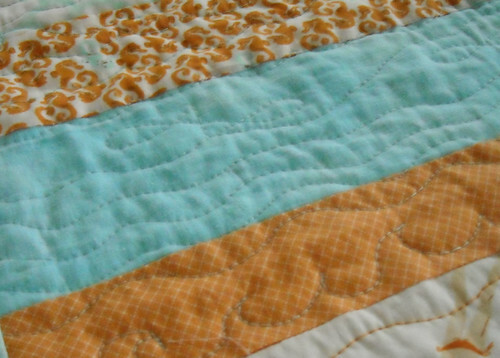 Such a cute quilt... loved the swirls & waves you quilted - the perfect finish! Cute girl too! Gracious, Vicki, that baby is CUTE! The quilt looks great, too. 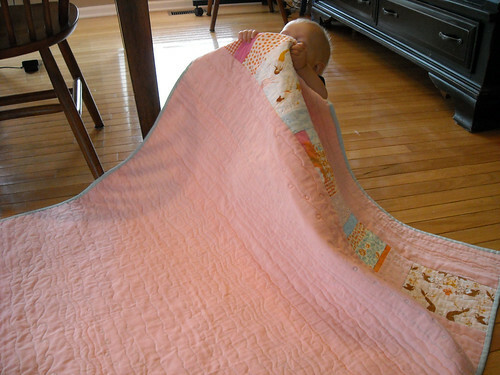 The stitch work on that quilt is amazing and of course the baby is adorable. I love the shot with the baby's little cute hand reaching out. The quilting makes this so cozy and cuddly! Not too mention the adorable orange and aqua fabric! Thanks for sharing! This is so sweet! I love it, and it looks like you have a pretty happy baby too! Gorgeous, Vicki!!! I love your wavy quilting, it's perfect with the theme. And the inset in the back is so much cooler than just solid fabric! it is fab! I am dieing to get some of that fabric, it is sooo great! 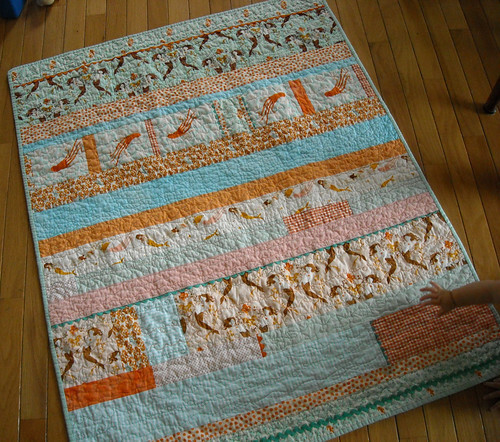 The quilt and the baby are adorable! 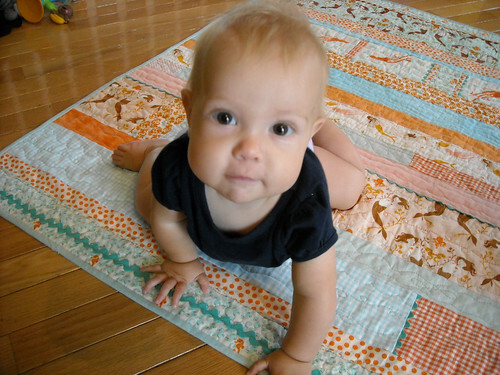 It's a beautiful quilt (the baby is pretty spectacular as well) and the quilting is really wonderful! I ADORE this quilt! I love the colors, the layout, the little bit of rick rack! I'm so glad I discovered your blog! I am just now going through comments on the Virtual Quilt Festival and have had so much fun reading your blog! I am so in love with this mermaid quilt, its beautiful! Wow - love this quilt. I'm a Heather Ross fabric fan, and you've used the fabric beautifully. I especially admire the quilting. Sweet!